As we near the end of 2016 we are reflecting on another fun and action packed year for the band. 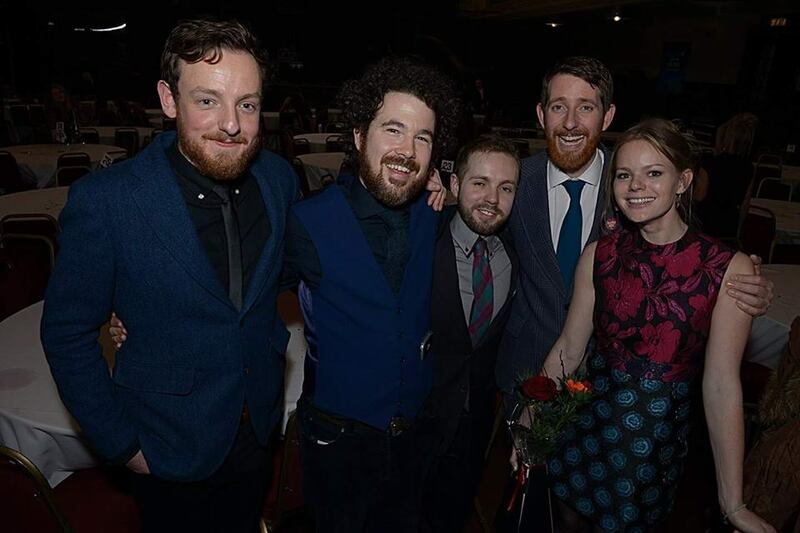 We rounded things off in a very special way at the Scots Trad Music Awards. where we were delighted and very humbled to pick up both Folk Band of the Year and Album of the Year. A sincere thank you to all who voted and also to the wonderful team who work so hard behind the scenes in support and make it possible for us to literally live our dreams. We are very grateful to all of the Active Events team – past and present, the legend that is Bob Buchan, our long suffering engineer Iain Thomson, Alex McNutt and to all the promoters, venue’s and festivals who give us the opportunity to play! Our album ‘Astar’ was inspired by our travels, the people we have met and musicians with whom we have collaborated. It is a multicultural celebration and a work we are very proud of. Bringing it to life would not have been possible without the energy, skills and talents of Greg Lawson Stuart Hamilton @ Castlesound Studios, Daniel Warren, James Morrison, Stuart Curnow and our guests, Yirrmal, Mark Atkins, Scotty Morrison, Olav Luksengård Mjelva and our dear champignons Le Vent du nord, each of who added their own beautiful colour to the record. Finally, to all of you who come out to support us at live shows and who buy our records, our heartfelt thanks, there’d be none of this without you! It’s been a year tinged with sadness also and we have lost many special souls including those who have been so influential and important in our development both individually and collectively. Love, thanks and farewell to John Macdougall, Angus Grant Jnr, Maggie Macdonald & Bill Kyle. We’re taking a bit of time off now, but can’t wait to start back with a bang at Celtic Connections 2017. On February the 3rd we’ll be at the Glasgow City Halls to put on a special show featuring some of good friends (Greg Lawson, Olav Luksengård Mjelva & Pierre-Luc Dupuis) for a reimagining of some of the music from Astar. The fantastic Beoga will also be sharing the bill with us, guaranteed to be a great craic night of music. Also keep you eyes peeled for a special Burn’s Night celebration on BBC Radio Scotland coming live from the festival on the 25th! Individually we’ll be out in various different guises over the festival. James Mackenzie & Calum are appearing as part of a new ten-strong piper collaboration Tryst, catch them on the 21st Jan (Also check them out on Facebook!). Megan will be performing at the Night for Angus (21st Jan), with Siobhan Miller (26th), Duncan Chisolm (28th Jan), Lauren Maccoll (4th Feb) and with flautist/singer Sean Gray for his New Voices commission on (22nd Jan). James Lindsay will also be on Sean’s gig as well as with Gaelic singer Mischa Macpherson (28th Jan).Ewan will be at St Andrews in the Square for the TMSA’s 101 Scottish Songs – The wee Red book (21st Jan) as well as joining Megan at the An Lochran – Stri is Buaidh concert (4th Feb). Phew, it’s going to be a busy festival! Our online store will be closed from today (20th) for the Christmas holidays. Any orders placed during the next couple of weeks will go out after the 4th of January. Wishing you all a merry Christmas and Happy New Year. See you in 2017!